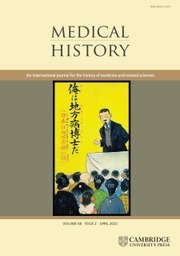 Medical History is a refereed journal devoted to all aspects of the history of medicine, health and related sciences, with the goal of broadening and deepening the understanding of the field, in the widest sense, by historical studies of the highest quality. It is associated with the European Association for the History of Medicine and Health, the Asian Society for the History of Medicine, and the World Health Organization's Global Health Histories initiative. The membership of the Editorial Board reflects the commitment to the finest international standards in refereeing of submitted papers and the reviewing of books. The journal publishes in English, but welcomes submissions from scholars for whom English is not the first language; language and copy-editing assistance will be provided wherever possible.